We left Kanchanaburi at 9 am by bus, transferred in Subphori where we were herded into a minivan that made it to Ayutthaya by 12:30 pm. I say “we” because I was accompanied by two Spanish girls I met in Kanchanaburi. And they made me realize how happy I am to be solo. In trying to travel with them for the day, I realized how much more you have to consider when traveling with more than just yourself: if they’re hungry, what they want to do, or how they actually think you’re supposed to be going the other way. Not to mention they knew English but only spoke Spanish except when talking to me. After a few hours of conversation I had only half a part in and discovering that I did not want to tip toe around making a decision just in case they wanted different, I easily removed myself from the situation. “I think I’m gonna explore on my own but let’s meet up later.” It felt like a bad breakup line, but it worked. I was back on the market as a solo traveler and ready to be single for a bit. 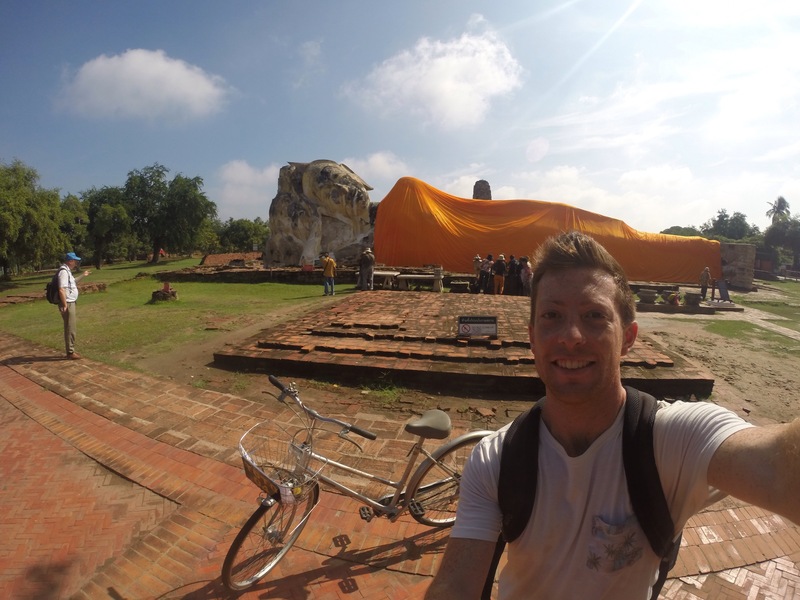 The past two days I rented a bike (50 baht = $1.50) and explore the city on two wheels. As someone that loves cycling and biked everywhere back in San Diego, I was so happy to get back in the saddle. 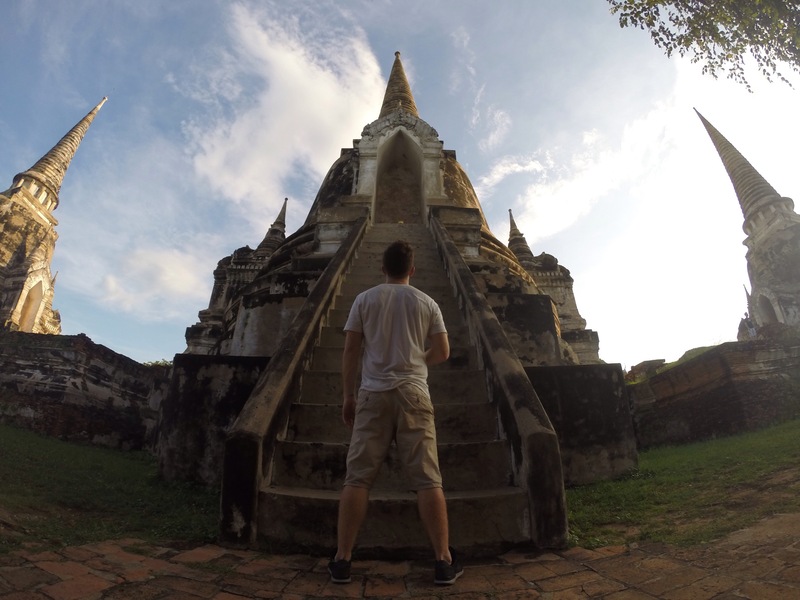 I cruised around the island city, surrounded by three rivers, seeing a number of temples, the old “Grand Palace,” the floating market, and unfortunately, elephants being used for tourist rides. Wat Mahtat and Wat Chai Watthanaram were two of my favorite temples. 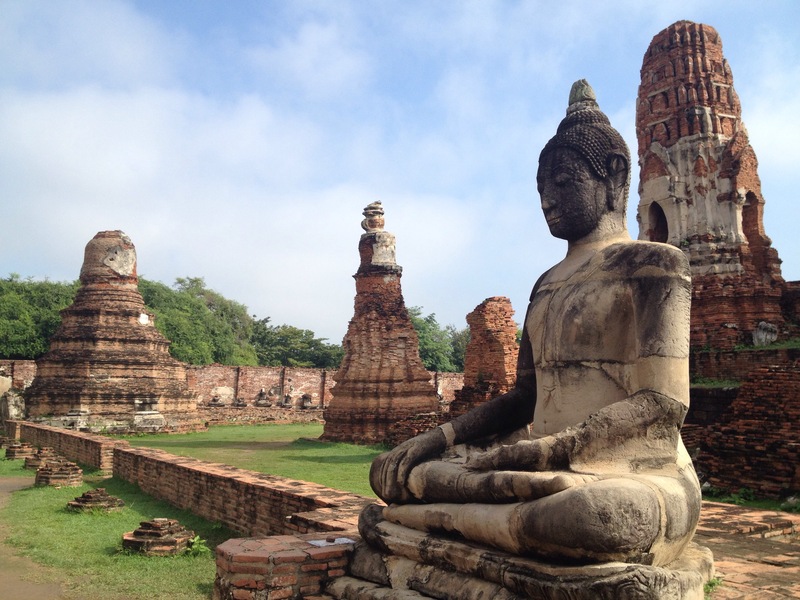 Wat Mahtat was all ruins with remnants of Buddhas everywhere. 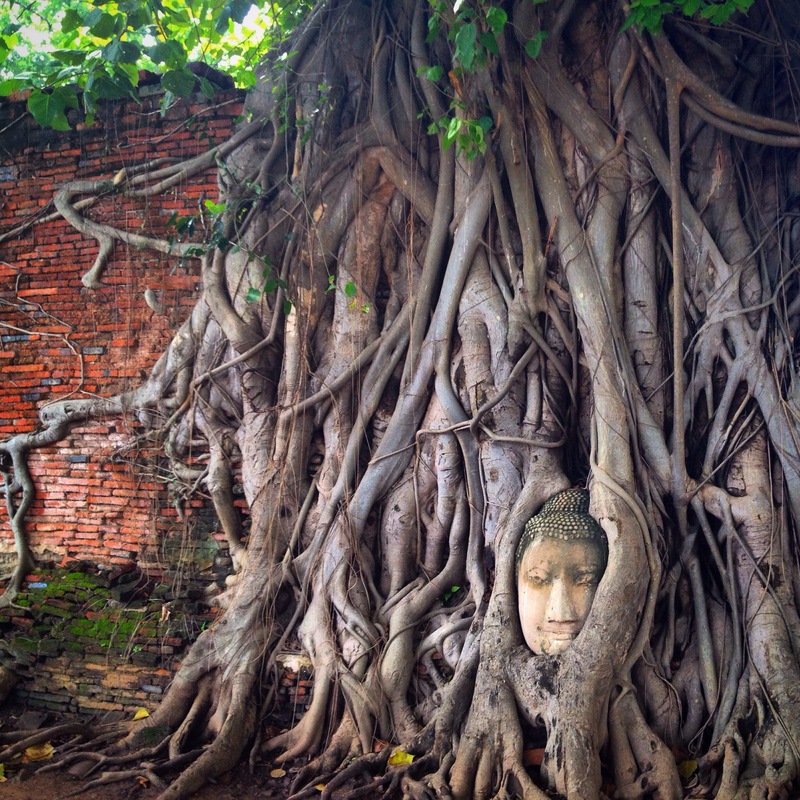 This included a Buddha head overgrown in a bodhi tree. Every Buddha I see, I’m overcome with emotion yet a sense of peace. How still and calm everything about him is is inspiring and beautiful. I think of Buddhism as a way of life: compassion, kindness, patience, honesty, virtue, respect, doing good for others, and loving everyone and everything. Buddha statues always change my energy. I’m reminded to take a moment to breathe and appreciate the current moment. Wat Chai Watthanaram is probably my favorite temple so far. It’s outside of town, just across the river, and though ruins, is probably the most in tact of any. 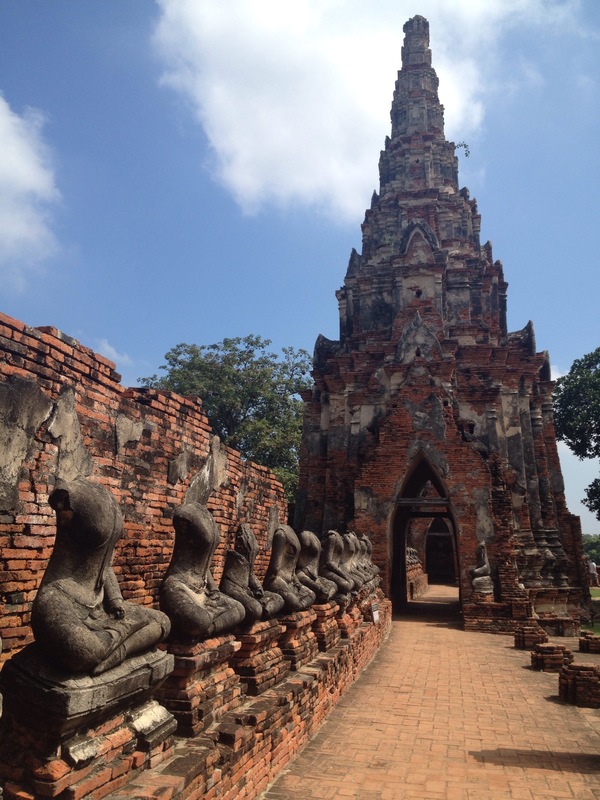 The temple is pretty symmetric, with the center Khmer style spire surrounded with busts of Buddha. It’s all set in a beautiful grassy square overlooking the river. 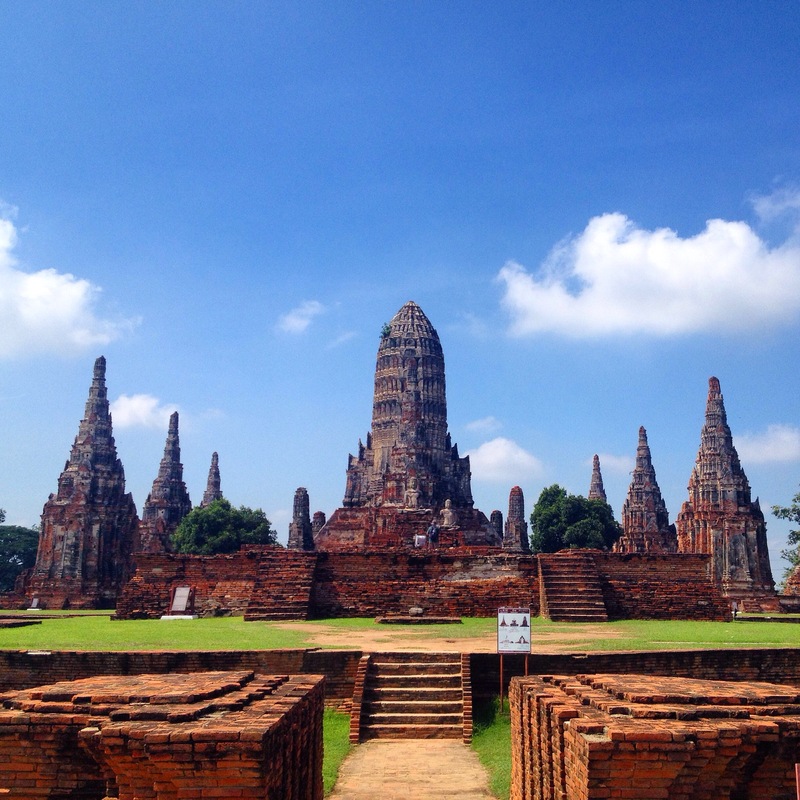 It’s so majestic and amazing, being so old and still standing, having seen hundreds of years of Ayutthaya life. I love traveling slow enough to enjoy down days in a city so you don’t have to go-go-go and see-see-see everyday.